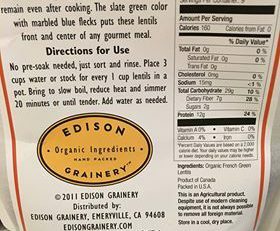 We continue to receive reports of errant gluten-containing grains in bags of dried lentils sold in the US. Health Canada just issued a recall on a brand of lentils for undeclared gluten. As a general reminder, under US GIPSA standards (Grain Inspection, Packers & Stockyards Administration), lentils are allowed to contain a certain percentage of foreign grain, including wheat, barley, and rye. As a precaution, please make sure to pick through dry lentils carefully and rinse them very thoroughly under running water. 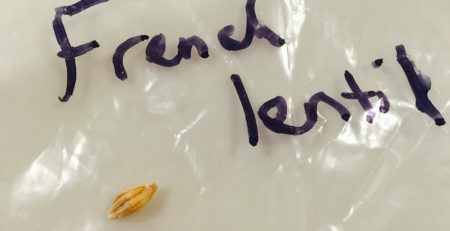 A bag of lentils purchased in the UK and containing foreign grain was sent by UK blogger Carly @gfreeb to senior research scientist Adrian Rogers for testing. Limited testing using the Gluten G12 ELISA was performed on the lentils. Results are shared with permission. 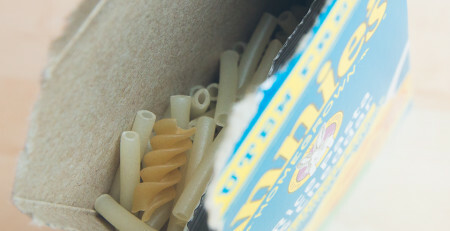 A sample of lentils was ground “as is” from the bag and tested. Results were 7 ppm of gluten. A second sample of lentils was picked through and foreign material was removed before washing. The picked through sample of lentils was rinsed 3 times in distilled water and then ground. Results were below the lower limit of quantification of 4 ppm of gluten. The rinse water was also tested and a low level of gluten was detected. 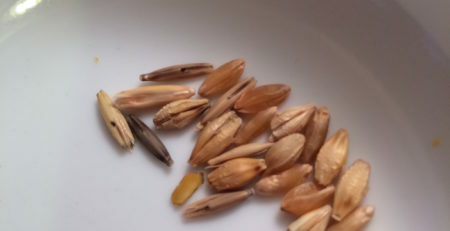 What to look for to define wheat, rye or barley in lentils? Sometimes I see yellow lentil looking objects that I think are yellow dried peas. Is that a correct assumption or should I be taking them out?? It helps. Will rinse my lentils 3 times from now on and check closely for foreign objects. Thank you for the information. 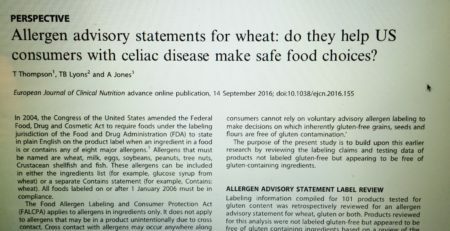 At this point, what is the “cleanest” source of dry lentils available from a gluten-contamination perspective? Impossible to say. Purity protocol lentils may be on the horizon soon. Thanks, Tricia. Is there a post on “purity protocol”? I am not familiar with this. Not yet. Hopefully we will be posting about a source of purity protocol lentils this year. Does this issue pertain to any other legumes? We’ve found the most cross contact with lentils but in my opinion it would be prudent to sort through and rinse all legumes. Has anyone tried products from 24 Mantra Organic, whether lentils or otherwise? I came across this brand from doing an internet search that led me to an online Indian food store (I am in the USA). 24 Mantra’s website emphasizes their organic standards, traceability, choosing farms, etc., not with respect to gluten but they do have gluten-free labeling on some items and I feel there’s potential for finding items with low risk of gluten cross-contamination. I may try ordering some lentils from that online food store (I shop Indian dot com). I haven’t gotten a response to my email to 24 Mantra, though. Maybe I will try again to contact them, or if anyone else does please post…. In general I am thinking it makes sense to try to source ingredients from places where wheat is just less prevalent than in North America, which may be the case in some but not all regions of India (? ).